If he’s confirmed by the Senate. Regardless of whether Tillerson manages to get confirmed, his nomination reflects the sometimes unfathomable extent of American power—American corporate power, that is. In 2014, Exxon earned $32 billion in profit, more than the GDPs of more than half of the countries in the world. At times, Exxon has exerted its influence in ways that supplant foreign policy. Someone like Trump, so prone to pick fights he doesn’t necessarily understand, needs a calming voice to advise him on foreign policy. Tillerson could be that voice, since his major foreign policy goal is to make business deals…. Of all Trump’s candidates for secretary of state, Tillerson seems like the least likely to lead America into armed conflict. He might be too pro-Russia, but that’s a small price to pay for someone who is also likely to be much more willing to sit down and talk with the governments of Iran, Venezuela, or China…. There remains the issue of climate change, since the secretary of state leads climate negotiations for the U.S. Here, too, Tillerson among the best of a bad lot. Exxon has long fostered climate change denial, but he has acknowledged that climate change is real and in 2009 came out in favor of a carbon tax. Tillerson has been a successful commercial statesman: Serving as ExxonMobil’s CEO requires adept skills in negotiating and managing a number of relationships across the world with numerous countries, organizations, and actors…. Tillerson’s ability to manage a relationship with Putin amidst deepening global tensions between the U.S. and Russia is more of a sign that he can successfully advance and manage complex relationships even when the geopolitical headwinds are against him…. 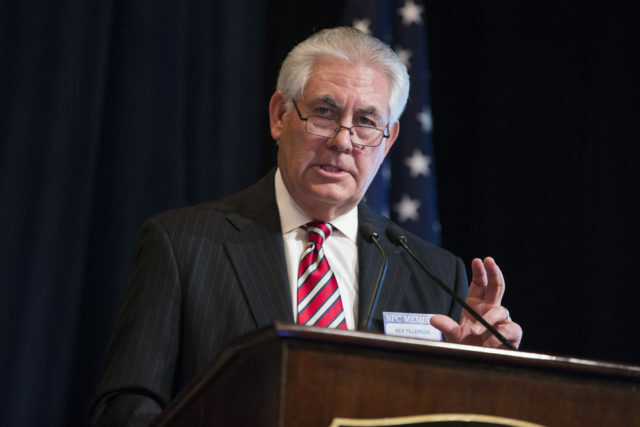 With Exxon’s extensive operations in the U.S., Tillerson has had to navigate Congress, the White House, and the domestic regulatory environment. A successful Secretary of State such as James Baker had a keen sense of both global affairs and U.S. politics….Tillerson arguably has had more domestic and international experience than any other Secretary of State since Baker. The Trump administration will have to be able to evaluate objectively Mr. Putin’s agenda and lead NATO in standing up against his aggression, while allowing for cooperation where possible. In naming Mr. Tillerson to lead the State Department and having Lt. Gen. Michael Flynn as his national security adviser, Mr. Trump will have filled two top national security posts with pro-Russia apologists…. Tillerson himself flew to Russia in 2011 to forge a deal with Rosneft to jointly drill in the Arctic Ocean. ExxonMobil remains the rare American company willing to put money and expertise into developing shale oil in western Siberia. 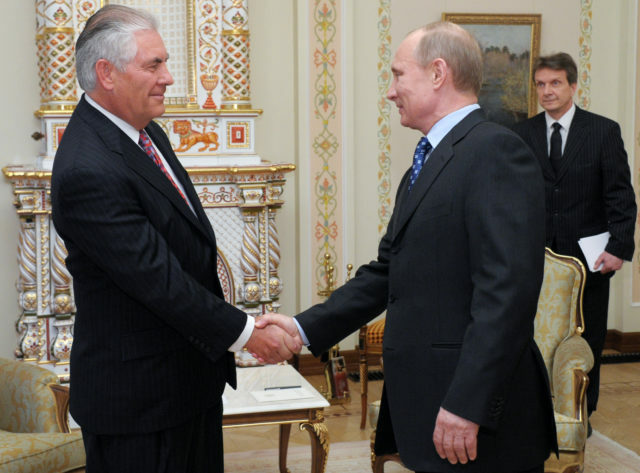 Putin even gave Tillerson Russia’s Order of Friendship award in 2013…. [T]he deeper point here is that Tillerson forged these ties with Russia and Putin, and sometimes thumbed his nose at U.S. foreign policy, precisely because he was pursuing ExxonMobil’s self-interest as a capitalist enterprise. The irony is that conservatives like McCain, Rubio, and Graham are supposed to be all about free-market principles: Businesses pursue their self-interest in the name of efficiency, profits, and market share, free of the sclerosis and empty posturing that come with politics. That’s what ExxonMobil was doing in Russia. The glitch is that mainstream conservatives in America — and certainly the Republican Party proper — want the U.S. to remain the globe’s pre-eminent superpower, promoting and defending not only its raw interests around the globe, but its particular political ideology and system of governance as well. By pursuing the first set of goals, Tillerson ran afoul of the second. WATCH: Columnist Charles Krauthammer on how Rex Tillerson’s ties to Russia are a liability because of Trump’s stated views on Putin and Russia. Henry Kissinger has long argued that the key to success in diplomacy is to put yourself in your adversary’s shoes and see the world from that perspective…. From this standpoint, Russia’s conduct has largely been reactive to misguided western policy. For example, its March 2014 military incursion into Crimea, home of the Russian Black Sea Fleet, was in response to the western-backed coup to topple a democratically elected, pro-Russian regime in Kiev a month earlier. It may have been a miscalculation on Putin’s part, but it was nonetheless a rational calculation. All this happens to be the view of Trump and his advisers. Which is why the president-elect’s nomination of Tillerson suggests U.S. foreign policy could enter a period of major reappraisal.